Let me know if it works for you, Mia — I hope it does! Okay – first, I would love this story just based on the fact that they reference HARRISON FORD!!! *ahem* and second – sometimes the dialogue runs too fast in my head and I’m afraid of losing it all so I have actually drafted several scenes of just dialogue and then filled in later. I thought it was a sign that perhaps I should just be a screenplay writer, but then I heard a well-known adult author at a writer’s conference suggest that as a strategy for when you are stuck or just for getting the dialogue to flow. So . . . not so alone in what I thought was weirdness, right? Anyway – great strategy. May try that this morning. JUST dialogue. I love it! I’ve done that writing exercise before, writing just dialogue, and then filling in with the “extras.” I like the idea of putting that context back in the dialogue rather than the physical cues. What a fun idea for a book; I had a sort-of similar idea churning in my head, maybe for a short story, so I’ll have to check out her book to see how hers unfolds. I’m assuming they’re on an online chat or something–that’s a lot of emails! The story takes place in 1999-2000, and the two characters just shoot emails back and forth using their work accounts, which is why Lincoln is able to read their flagged (inappropriate for the office) messages. It really is a very cool format for a story, though it took me a little time to get used to. I was amazed at how complete Jennifer and Beth’s friendship felt, even though I only got to read their emails. Funny, because my first drafts are filled mostly with long paragraphs of description and narrative. I always have to go back and chop that stuff to make room for dialogue (because let’s face it… dialogue is so much more fun to read!). But, now that I’ve found a new method for writing dialogue, I think I’ll probably end up with lots more of it in my early drafts. Thanks so much for spreading the word about this post, Erin! Writing dialog is my absolute favorite. A lot of the times I’ll write it out screenplay style with nothing in between and go back and write that all in after. I find it really helps me get the flow of the dialog and write snappier conversations when I’m not forced to think about anything else in the scene. My first drafts are usually super short because they’re so dialog heavy, but I’m okay with having to go back and fill in since it’s so helpful to see conversations in dialog for me. Great thoughts! You should totally find a copy of ATTACHMENTS to read, Ghenet. 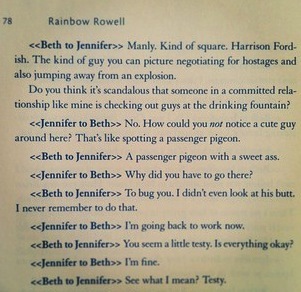 I really liked it, and even though it’s an adult novel, I still got the same tingly first-love feelings I got from E&P. I have no tips, but thank you for sharing this one! I think writing dialogue this one definitely forces you to really think about characterization in speech. Will have to try it out myself! What a clever concept for a book! And talk about a challenge communicating all the necessary emotion without body language or inner monologue. A lot of my scenes start out as snippets of dialogue that I jot down in my notebook before fleshing out the rest, not so much because I planned to do it that way but more because the dialogue is often what pops into my head first. Maybe having that dialogue established is the difference between the scenes I find easy to write and the ones I struggle with. I might have to be more deliberate about this approach and see what happens! The way you articulated this was really helpful, so thanks! Oh, and i also wanted to thank you for posting the link to that Plot Dot Test! I’ve been trying to get through that floundering, middle stage of my WIP and found it really useful for figuring out what scenes are making the story drag. Great posts, Katy! Yay for the Plot Dot Test… Such a simple, awesome strategy, I think. “Maybe having that dialogue established is the difference between the scenes I find easy to write and the ones I struggle with.” <– Totally me. When I know exactly what characters need to say to one another, the scene usually comes really easily. Best of luck making it through your middle. Always my trickiest part too. And please do try to pick up ATTACHMENTS. It's a very entertaining read! 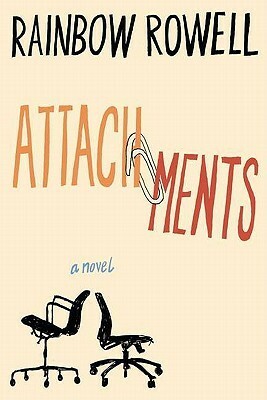 I loved ELEANOR & PARK, so I’m excited to read ATTACHMENTS, and the idea around it is wonderful. I think it’s great that seeing new ways of doing things can spark something in us as writers. Maybe we’ll use it, maybe we won’t. But getting us thinking always improves our writing, I believe. How exciting to try something different–and have it work out! I agree, Heidi. I loving coming across new and possibly untraditional writing methods. Even if they don’t end up working for me, I’ve at least tried something outside the box, and that gets me thinking and experimenting, which always strengthens my writing. I try to use dialogue tags sparingly too, Jaime, though that’s been a challenge with this WiP because it’s written in third-person. Still, this method of laying out an entire conversation before going back and tucking in tags and other “extras” is really working for me, which is exciting! I’ve read this format before and can easily picture things. It’s an interesting way of writing dialog. I want to read this book. I loved E&P. I hope it works for you, Melissa! I’ve adopted it as a new technique for dialogue heavy scenes and it’s really working for me… Yay!